With Sailor Moon Crystal well into Season 3, I’ve been feeling so inspired to make more cat-themed projects. Kitty ear hats are starting to crop up everywhere, so I just had to join in the fun. 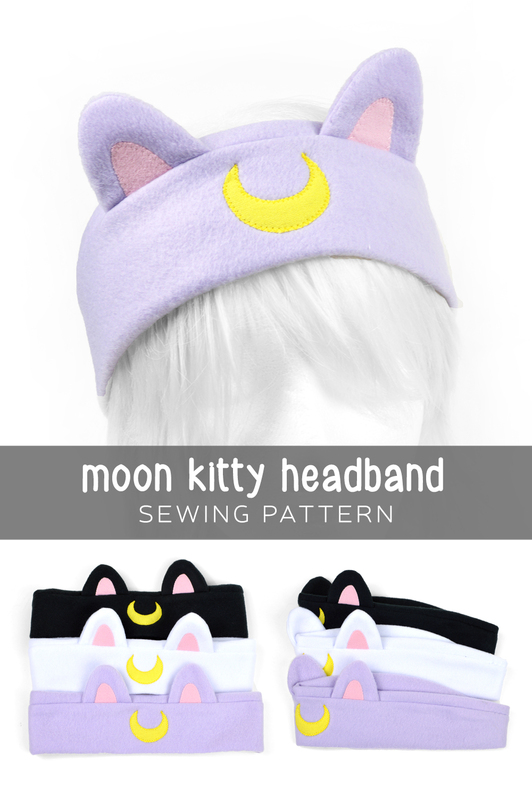 This simple fleece headband has tiny cat ears added for that little extra something. I’ve transformed mine into Luna, Artemis, and Diana, but you could leave yours plain for a more classic look. Since fleece is so easy to work with and skipping the applique still makes for a fantastic looking headband, I think this project would be great for complete beginners. It’s also my first multi-sized pattern! The length of the headband you cut depends on the size of your head after measuring, so be sure to check that first before you get started. It ranges from 19” heads to 25” heads so it should fit many kids as well as adults. Categories: Accessories, Free Projects, Nerdiness | Tags: artemis, cat, cute, Diana, diy, fleece, free, headband, how to, kawaii, kitty, luna, moon, pattern, project, sailor, sewing, tutorial | Permalink.